The College Board has changed the AP French and German exams this year and aims to make similar (the same?) changes to AP Spanish next year. In light of the coming changes, I decided to get a jump start on redesigning my AP curriculum. I had 9 units + a month exam review + post-exam wrap-up and it was just too much. And I knew I at least needed to add a unit on art and literature, based on material we’ve seen in the exam recently that has thrown my students off some. How do societies and individuals define quality of life and how has this changed in contemporary society? How do our past experiences affect the ways we relate to the world around us now? How do our cultural practices, products, and perspectives influence how we interact with the people and products of other cultures? 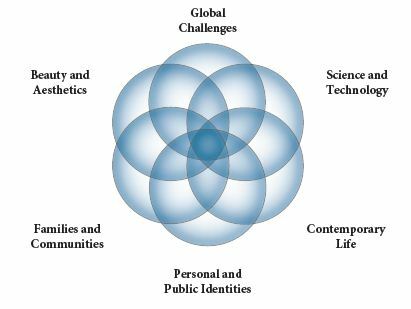 What social and philosophical issues pose challenges to societies throughout the world? How do history, faith, and multiculturalism contribute to those challenges? How do history, faith, and multiculturalism offer solutions to those challenges? What roles do families and other committed relationships play in an individual’s life in different societies? 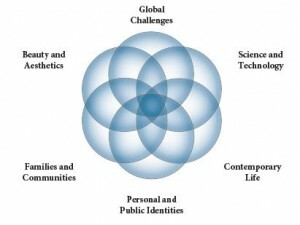 How are personal, cultural, and religious traditions changing in a global community? How are science and technology affecting or improving global issues like politics and social needs? In what ways can governments effectively respond to the healthcare issues caused by demographic and economic changes like immigration and recession? What responsibility do successful artists, musicians, writers, and designers have to effect change among disadvantaged populations? In what ways are these popular icons working to improve their native societies and cultures? What environmental, political, and economic issues pose challenges to societies throughout the world? What are the origins of those issues? What are possible solutions to those issues? What curriculum do you use? Would ths work for Spanish 3?? I use Wayside Publishing’s Triángulo infrequently as a support, and we read a few stories out of Abriendo Paso: Lectura. Otherwise I don’t use a curriculum; I design it myself, mostly web-based. These issues are a little heady for Spanish 3 because they require a lot of expressing opinion, which is a higher-proficiency skill. I have finished outlining what we are doing in Colección 1, and you are more than welcome to take and adapt whatever you can for Spanish 3. Remember the difficulty is not usually in the source, it’s in the question you’re asking. Keep tasks at student’s level (or a little above) and you can use just about any source. Good luck!